John Osborn is President and Chief Executive Officer of BBDO New York. John has been in this role for nearly ten years – longer than any other New York agency executive. Under John’s leadership, BBDO New York has increased revenues by more than 50%, expanded its client base to include categories like btob, retail, healthcare and more, and diversified its workforce. The result: BBDO New York has been named an Agency of the Year 15 times by various media outlets. 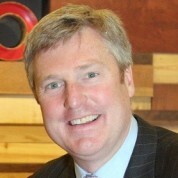 John joined BBDO New York in 1991. Over the years, he has demonstrated that he is an energetic, positive and passionate leader with a proven ability to build strong client relationships and to lead big multi-disciplinary teams in the creation of powerful communication programs. For example, he has been actively involved with many of the agency’s clients including FedEx, Foot Locker, GE, Lowe’s, Mars, Monster.com, Visa and the American Red Cross. He began his BBDO career on Pepsi and was the principal architect of the agency’s integrated marketing efforts, expanding the agency’s service offerings to include digital marketing, direct, CRM, custom-publishing and more. He was named President and CEO of the New York agency in February 2004. Today, BBDO New York is delivering some of the most innovative cross-channel ideas of any agency, while continuing to deliver some of the best TV work in the industry. For example, commercials from BBDO New York were voted the most popular in the Super Bowl for two of the past four years for Snickers and M&M’s. And once again, BBDO clients will be among the most visible in this year’s game. Then there’s the wildly popular “It’s Not Complicated” campaign for AT&T featuring a group of precocious kids talking about why bigger is better, faster is better, doing two things at once is better. Beyond this, John’s notable accomplishments over the years also include his involvement with the “New York Miracle” campaign, which helped lift spirits of New Yorkers in the wake of the September 11 attacks. John has been equally active outside business, lending his talents to other important causes. For example, he is President of the Board of Directors of the Police Athletic League of New York and serves as a Board member of the Christopher & Dana Reeve Foundation. In addition, last year he joined the Board of the New York Chapter of the American Red Cross. John is passionate about the importance of diversity in the industry. He has served as Chairman of the Board for the Center for Excellence in Advertising at Howard University, and as Chairman of the Board of the American Advertising Federation (AAF), the “unifying voice for advertising.” More recently, John accepted an invitation from Fordham University to serve as an Executive-in-Residence for its Center for Positive Marketing. In recognition of his accomplishments, John was a recipient of a 2012 AdColor Award celebrating diversity champions in advertising, media, marketing and public relations. In 2003, he was inducted into the AAF Hall of Achievement, which honors people 40 years of age or under for their contributions to business. He has also been named to the Crain’s New York Business list of “40 under 40” as well as BtoB magazine’s “Who’s Who in BtoB.” In 2006, John was named a “Young Global Leader” by the World Economic Forum. John earned his BA at Dartmouth, for which he continues to serve as a member of its Alumni Association and Friends of Dartmouth Hockey Program. He is married to Lesley and is the proud father of a 9 year-old daughter (Caroline) and an 8 year-old son (John Jr.). "There is no greater investment than in the advancement of youth. The Global Teacher Prize rightfully recognizes the real enablers and ensurers of our future -- our teachers. We are proud to support this growing movement. "